A sweet and cheerful mix of springtime blossoms, this is the perfect arrangement to make that special someone smile. 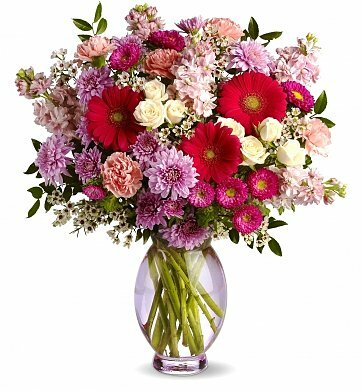 The eye-catching arrangement features a variety of fresh flowers, such as spray roses, Gerbera daisies, Matsumoto asters, carnations, cushion mums, stock, and much more. When presented in a stylish vase, the bouquet overflows with loveliness and fond wishes. Measures approximately 20" x 23". Perfectly Pleasing Pinks is a hand delivered gift. These gifts are delivered by one of our local design centers located throughout the United States and Canada. Same day delivery is available for most gifts when ordered before the cutoff time. The cutoff time for Perfectly Pleasing Pinks is 2 PM in the recipient's time zone. This was a birthday bouquet for my daughter. And it was beautiful--very vibrant reds, pinks, and purples. She loved it. I purchased this bouquet in the upgraded premium for a manager in our company. She was very pleased with the freshness, flower selection, and size. I usually do not get comments back as bouquets are sent away so it was nice to receive such a positive response. I would recommend this arrangement, it was certainly a beautiful get well boost.